Papier-mache is a French term meaning "chewed up paper." It is also a term used to describe a crafting material made up of paper pulp or strips and paste. Often called paper mache in the United States, it is a versatile material that can be used by children or adults to create simple or complex items. 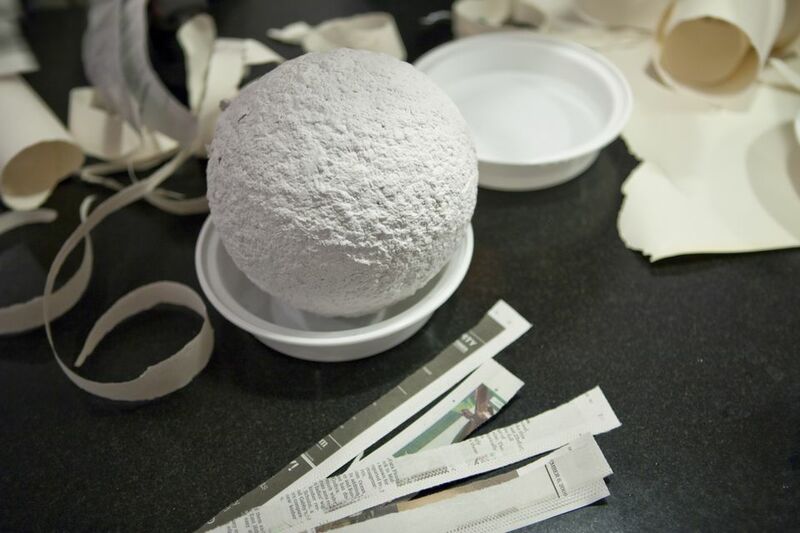 To create a paper mache object, you can either cover a form with sticky strips or pasty pulp. Once the paper mache dries, it can be painted or decorated. This art form has been used for thousands of years. Ancient Egyptians created paper mache masks, while Persians created bowls and trays and Europeans used decorative paper mache in place of painted wood or plaster. While it is certainly possible to purchase paper mache paste, many people prefer to make their own. By making your own paste, you can control the quantity, quality, and effect you create. You can also have a lot of fun with your kids as you experiment with different recipes for making this gluey glop. Try these recipes or experiment with a variety of materials to create your own paste. Consider the no-cook recipe if you are working with young children, as they can get hands-on in the process. If you're working with older, craftier, children, you may want to try the resin paper option as it will allow your children to create a permanent piece of artwork that they can keep for a long time. No-Cook Paste Recipe: This simple recipe is made entirely with ingredients and tools you likely already have in your kitchen cupboard. Flour, water, a bowl, and a whisk are all you need. Cooked Paste Recipe: This paste recipe is very similar to the no-cook but it is supposed to be a little stronger and is usually a little smoother. Of course, it takes a little more time to cook—and your little ones will have to wait for the paste to cool. Resin Paper Mache Paste Recipe: You will have to go shopping to buy resin powder to make this paste. It will give your finished paper mache project a hard finish and will also make your finished projects more durable. You can deviate from recipes and create your own paste from known paste-like ingredients. You can experiment with materials and see what works best for you. Liquid starch (undiluted): Although primarily for ironing clothes, this thickened, sticky liquid is perfect for paper mache projects. Wallpaper paste: Follow the directions from the manufacturer to mix this paste. White glue: White glue mixed with about one part water with two to three parts glue. You can use this mixture for a small project. If you are making large paper mache items, you will likely want to use strips of newspaper to create the general form. But, if you plan to give the form details, for example, facial features or ornamentation, then you will need a clay-like pulp in order to sculpt those intricacies. Paper mache pulp is what you use. This pulp is more like a thin clay and should be used as a final layer simply by spreading in on your project. This pulp is used instead of paste. Newspaper pulp: This is a simple recipe of only four ingredients: newspaper, water, salt, and glue. For the ingredients to set, you will need at least a few hours. Egg Carton pulp: This recipe is similar to newspaper pulp, but instead of newspaper, you will need paper egg cartons. Dryer lint: Your clothing dryer catch collects lint most every time you do laundry. Upcycle your clothing lint into a beautiful creation. Use the same ingredients as the newspaper/egg carton pulp recipes. Mix the lint with just enough water to make a sludgy oatmeal consistency.